Vinyl banners are becoming more popular as businesses realise how quick they are to produce and how cost effective they can be. Here at Banners Perth, we pump out more banners every week than ever before and with our investment in the latest printing technology, you can be assured of brilliant quality and fast turnaround. 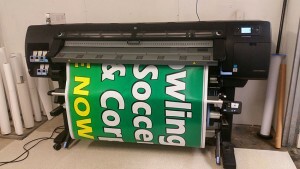 Seen here is a 5000mm x 1300mm banner being printed onto PVC which we will then sew and add eyelets to. If you want ropes or pockets, we can do that, too. In fact, with plenty of finishing options, we can accomodate any kind of banner your business requires. Send us an email with your request and we’ll get back to you straight away with a quote for your banners. Perth’s best banner shop is ready to serve you. This entry was posted in Banners by Banners Perth Staff. Bookmark the permalink. Just wanting to get a quote on a 5 m x 1.3 m banner. I want a quote for a cover up of a truck aluminum body. L × H = 4.2 m × 2m. The Colors I want are blue and white. Our logo has some grey. I am thinking of including a picture of a kitchen made by us. And bullet point inclusions. Also note that the body isn’t a flat surface so what options would i be looking at? Hi, I am after a price on 2 x pull up banners, printed 1 side only, 2000mm x 850mm – delivered to our warehouse in Malaga. I would like to arrange for a vinyl banner to be used for our company promotion at a corporate golf day. could someone contact me to discuss on 0477 428740 or 089335 3800.